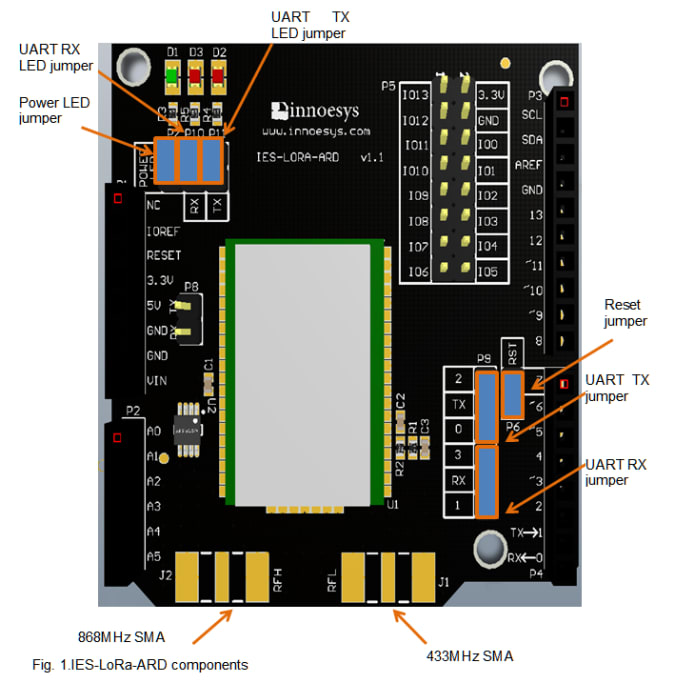 Innoesys LoRa Shield is an Arduino shield for Low-Power Wide-Area Networks (LPWAN) designed for long range communications with low bitrate. The board is powered from 3.3VDC power source provided by the Arduino board and the different components are enabled with active high logic. The power supply pins for the IES-LoRa-ARD shield. 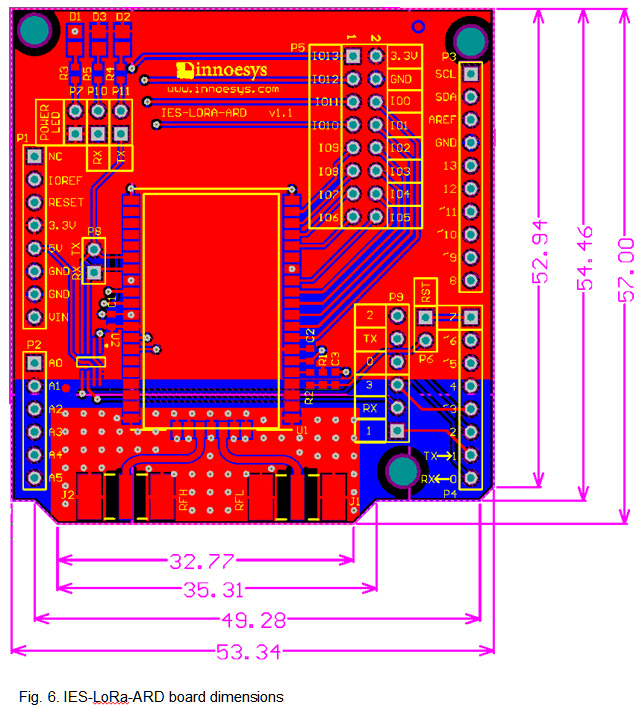 TX and RX jumpers are used to connect the LoRa module RX & TX signals to the Arduino. LoRa TX signal can be connected either to the default Arduino UART RX signal (pin 0) or to the pin 2 (digital input). While LoRa RX signal can be connected to the Arduino UART TX signal (pin 1) or to pint 3 (digital output). Digital pin 7 can be used for software reset of the module. It can be connected/disconnected using the RST jumper. LEDs: The onboard jumpers can be used to connect/disconnect the LEDs. Connecting the Power LED jumper, the Power LED is ON when power is applied to the shied. 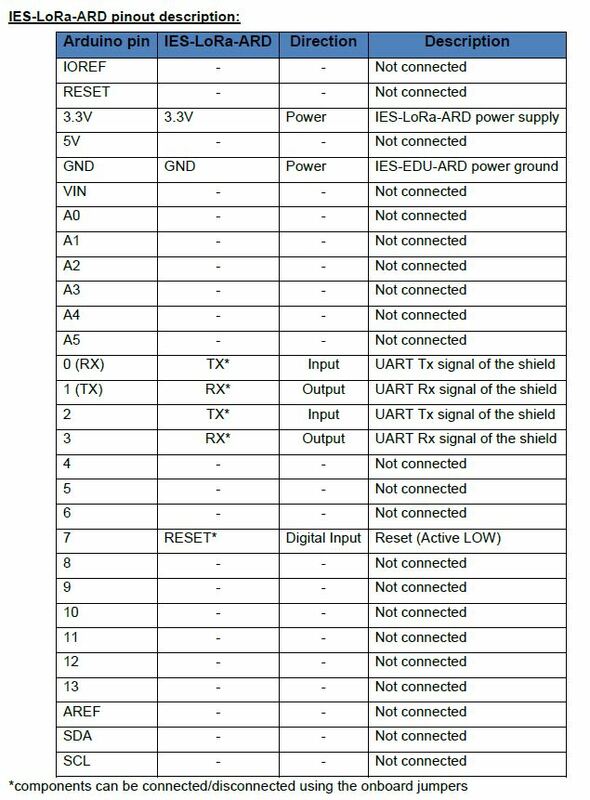 UART TX & RX LEDs are used as UART signal indicators when there is a communication of the LoRa module with the Arduino. P8 header pins: These pins can be used to probe the UART RX and TX signals of the LoRa module. The shield can be programmed using the Arduino IDE or any other development environment for AVR microcontrollers like Atmel Studio.